Have you ever met someone who inspires you to be the best that you can be? – Someone who makes you believe in the impossible dream? Well, I just did. His name is Phil Bundy and today he is my hero. Against some pretty big odds (43 of them ;)), Phil has awakened a dream that’s been sleeping inside of him for over 2 decades – Phil is on a quest to secure his PGA Tour Card at 43 years of age. When I first heard about Phil, I was reminded of the book “Awaken The Giant Within” by Anthony Robbins – a book that is all about controlling one’s destiny – about living one’s dream. I read that book when I turned 40 and it inspired me to make some significant changes in my life. Phil also had an epiphany at 40 – but his inspiration didn’t come from a book. 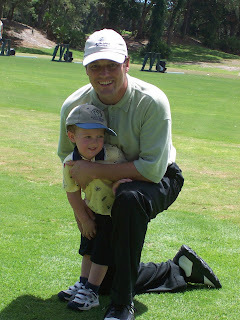 Rather it came from his 3 year old son, Charlie, during one of their many dad and son outings at the golf courese. Seeing little Charlie run across the fairway with pure joy on his face rekindled Phil’s life-long love with golf. And then and there, he made a commitment to live his dream of being on the PGA Tour. Reading his story gave me goosebumps and I just had to talk to him and find out more. Subscribe to Phil’s RSS feed of his website and follow his quest on his blog. Check out his dream team as well – pretty darn impressive, don’t you think? And don’t forget, you can also find Phil on twitter. Phil is a man who makes us believe in ourselves because he could be any one of us. If he can do it, why can’t we? And although he may be an “everyman” in our eyes, I know for certain that in the eye’s of his child, he is a giant! Best of luck Phil! We’ll be watching and cheering you on!